As Typhoon Koppu batters the Philippines, it's not strong winds — which are usually the biggest danger of tropical cyclones — that have many rushing for safety, but rather the huge amounts of rainfall, which have submerged the country in dangerous floods. Already, 60,000 people have been evacuated from their homes, and at least two have died (some reports point to as many as 11) since the storm made landfall on the main island Sunday morning. Photos of Typhoon Koppu show people in real danger, swimming for safety, bringing what belongings they can and finding any way possible to higher ground. More than a meter of rain is forecast for just a few days — more than Seattle sees in an entire year. The rain has already inundated many rural areas with some villages entirely underwater. Local residents are trapped on their rooftops awaiting rescue from the military and volunteer rescue units. Regional rescue officials estimate 70 villages are flooded with waters too deep for military trucks. 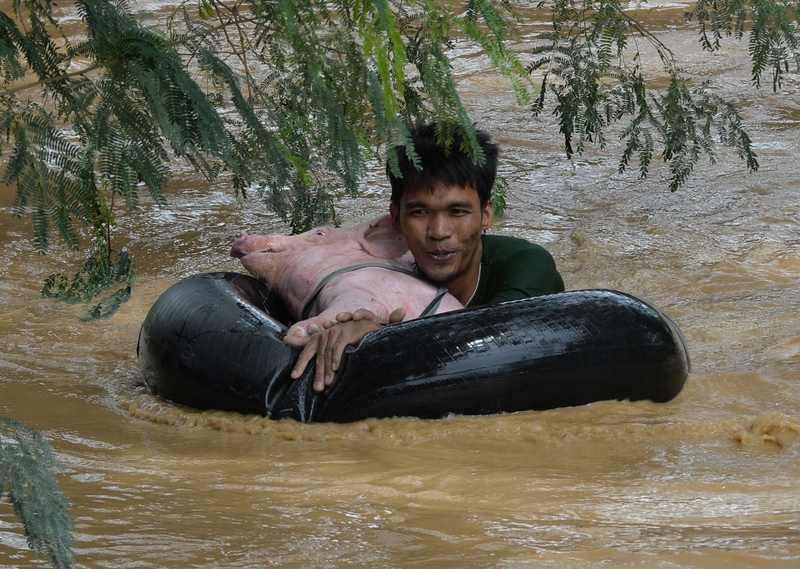 Rubber boats have been sent instead, but only 10 teams are up and running to help the rescue effort. Officials said that many had not worried about the storm's impact because its strong winds had largely missed low-lying areas. The Philippines typically see about 20 major storms a year. The worst, super typhoon Haiyan, hit in 2003, killing more than 7,000. Typhoon Koppu is the second-strongest of the year, with top wind speeds reaching 130 miles per hour on Sunday. Even though the brunt of the storm and accompanying winds did not hit large population centers like Manila, the high waters have proven to be a formidable challenge. Koppu was downgraded Monday to a severe tropical storm by the Japanese Meteorological Agency, which is responsible for tracking the storm. But the Filipino weather agency has left the typhoon classification. In any case, the storm has proved mother nature should not be underestimated.